Beebe Healthcare’s Same Day Surgery, PACU, and Registration teams won third prize in a national Positive Promotions volunteer recognition contest. The contest asked healthcare teams to describe how they honor volunteers each year. Doris Lehman, a Beebe team member, received word recently that Beebe won third place in the contest. The team was presented with a check for $100, which they plan to use for the 2017 volunteer luncheon and prizes. Last year was the team's 25th year honoring their Beebe volunteers and it is very gratifying to receive recognition both for our department and Beebe Healthcare, said Lehman. Shown are (left to right) in back: Doris Lehman, Patient Care Tech; Patricia Valencis, RN; Karen McCauley, RN; Mimi Hernandez, RN; Annette Wright, Tech/Secretary; Rhonda McManus, RN; Marylou Warren, RN; Eileen Hardy, RN; Jean Shoellig, RN; Gerri Davis, Scheduler/Secretary; and Lisa Messick, RN. 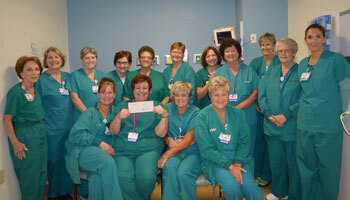 In front are: (left to right) Deborah Cofield, RN; Pat Kuster,RN; Leslie Elliott, RN; and Tracy Williams, RN.